Denver Water installed the Terlyn Cooling Tower Water & Energy Conservation Program on the 700 ton Marley cooling tower system on their building’s headquarters. 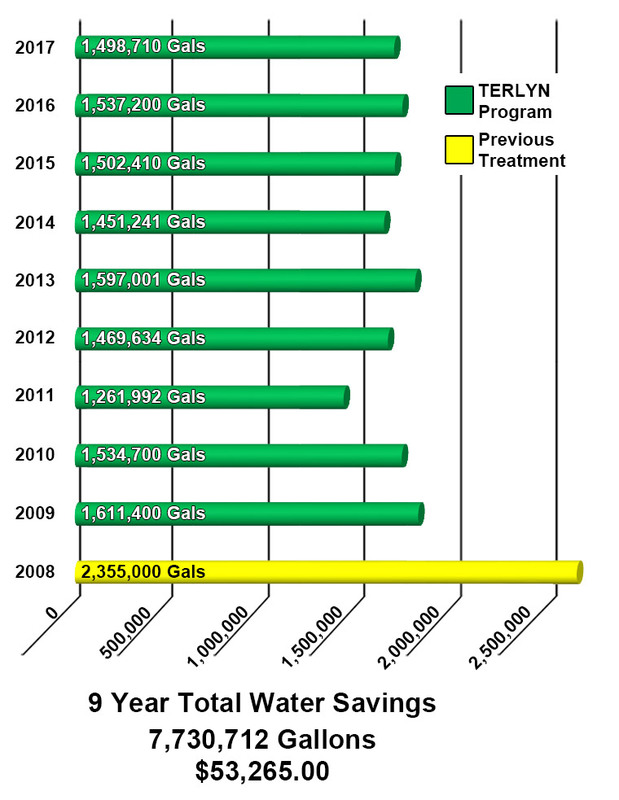 The Terlyn Conservation Program’s success produced an annual water conservation of approximately 250,000 gallons per year. Their website states that commercial, industrial and institutional customers can make similar water-saving changes to their cooling towers and earn an incentive from Denver Water for doing so. They now offer a Cooling Tower Water Conservation Incentive Program to further encourage cooling tower water conservation. This program pays cooling tower users $18.50 for every 1000 gallons of water saved over a one-year period. Customers can earn 50 percent of project cost up to $40,000. Projects must save at least 100,000 gallons per year to qualify. The water savings potential for a building this size is much greater in most other areas of the country that have lesser quality potable water. With normal potable water quality, traditional water treatment programs usual maintain an average of only 3 cycles of concentration, which requires 13% more waste than at 5 cycles.